← How to convert a document of mht to picture? The operation in Figure1 is the main process of the conversion of mht to png format and this article will interpret the whole conversion to you. First,you should have a converting software installed in your computer.The software must have the function of converting mht to png.If the software is cheap,fast and easy to use,it will be better.There is a such converting software called HTML Converter Command Line.It allows you to create previews or thumbnails of web pages in a number of different formats, such as TIF, TIFF, JPG, JPEG, GIF, PNG, BMP, PCX, TGA, JP2 (JPEG2000), PNM, etc. HTML Converter Command Line also allows you to convert web pages to PDF, PS (postscript), WMF, EMF vector formats. 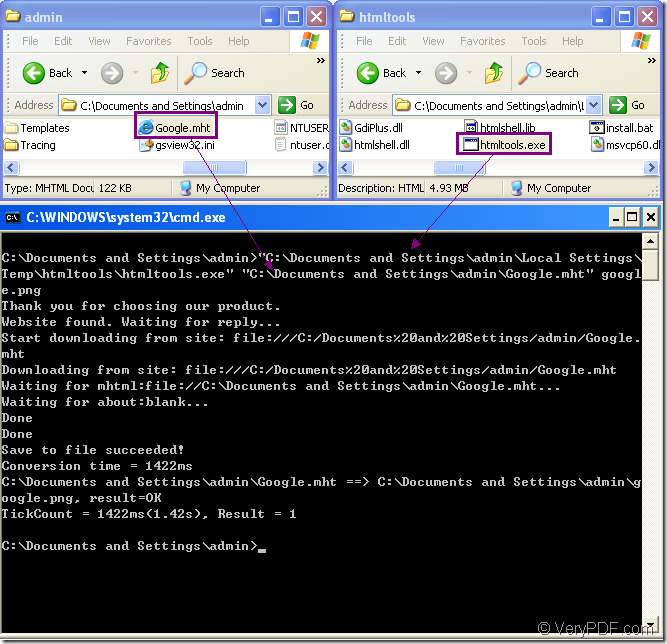 You can download HTML Converter Command Line at http://www.verypdf.com/htmltools/htmltools.zip. You will find it is a zip file when just been downloaded to your computer and you need to unzip it. Many software need to be registered before using,so do HTML Converter Command Line.You will get a register code when you buy the software.Then you can run cmd.exe program and input the code under the installation directory of HTML Converter Command Line in the dialog.Click “Enter” button.Then you can use all the functions without any limitations. The following contents are the explanation to Figure1. 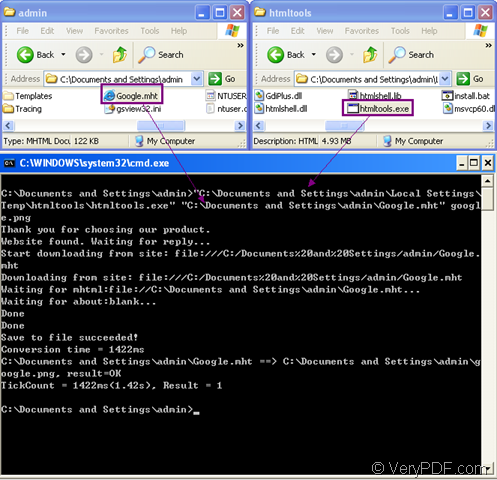 The dialog box at the bottom of Figure1 is cmd.exe dialog box which can be opened by clicking “start”—“run” and inputting “cmd” in “open” edit box,then clicking “OK” button.It can also be opened by the hot key “Windows” + “R”. Then you can input the command line in cmd.exe dialog box.The command line should contain called program,source file and target file(If there is no information about target file,the source file will be converted to pdf file by default). htmltools.exe stands for the called program which you can see in the second dialog box of Figure1.It is framed by the rectangle.Htmltools.exe is the executable file in HTML Converter Command Line,also the most important part of this conversion. output.png stands for the target file. "C:\Documents and Settings\admin\Local Settings\Temp\htmltools\htmltools.exe" is the path of called program.You can drag the file into cmd.exe dialog box directly for convenience. "C:\Documents and Settings\admin\Google.mht" is the path of source file.It can be dragged,too. google.png is the name of target file. When finishing to input the commands,you can click “Enter” button on your keyboard to run the conversion of mht to png.In a few seconds,you can find your target file in the specified location.If you didn’t specify the directory for the target file,you can find it in current directory. You can download HTML Converter Command Line and try the process yourself. How to convert wmf to gif?